Test your creativity with this deliciously unique recipe. Get adventurous on the Island Grillstone! 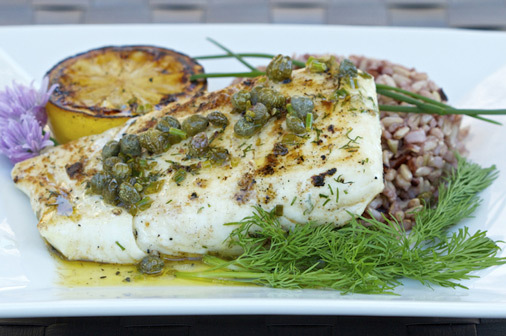 Try this tasty barbecued halibut recipe to satisfy your seafood craving. Heat up the island grill stone. Brush lemon halves with olive oil. Place it on the island grill stone for caramelisation. Pull the lemons off after a couple of minutes and then let them cool down. Squeeze the lemons and set the juice aside for dressing. In a bowl whisk together 3 tablespoon olive oil with 1 tablespoon lemon juice. Add chives, capers, salt and pepper. Mix well and set the dressing aside. Prepare the dry rub by mixing granulated garlic, chopped fresh dill, salt and pepper. Spread extra virgin olive oil on halibut then sprinkle dry rub all over the halibut. Place halibut fillets on the island grillstone and grill on both sides. In a serving dish place grilled halibut with cooked rice and grilled lemon. Drizzle prepared lemon caper dressing over the fish.